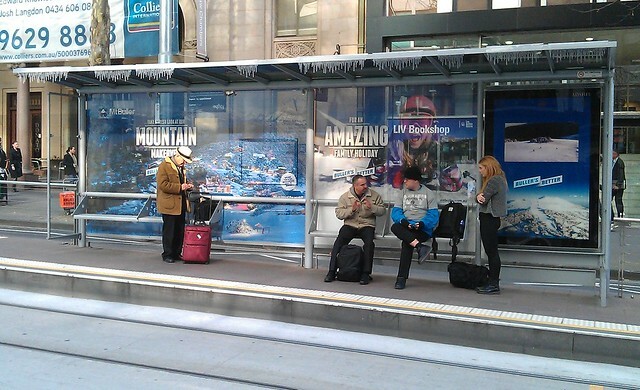 Fake icicles on this tram stop, to advertise Mount Buller. I wonder if anybody except me even noticed. Next → Next post: Is this tram route map the wrong way round? reminds me of the fake snow on the ground in outdoor scenes of Hogans Heros sitcom. With the freezing weather we’ve been having lately – are you sure they are fake icicles? Real icicles are usually longer than these. I used to snap them off of the gutter and eat them when I was a kid in Pennsylvania. Sometimes the fire dept has to be called to remove large icicles hanging dangerously from buildings where they could snap off and possibly injure or kill someone. the chick in the grey cardie looks cold.